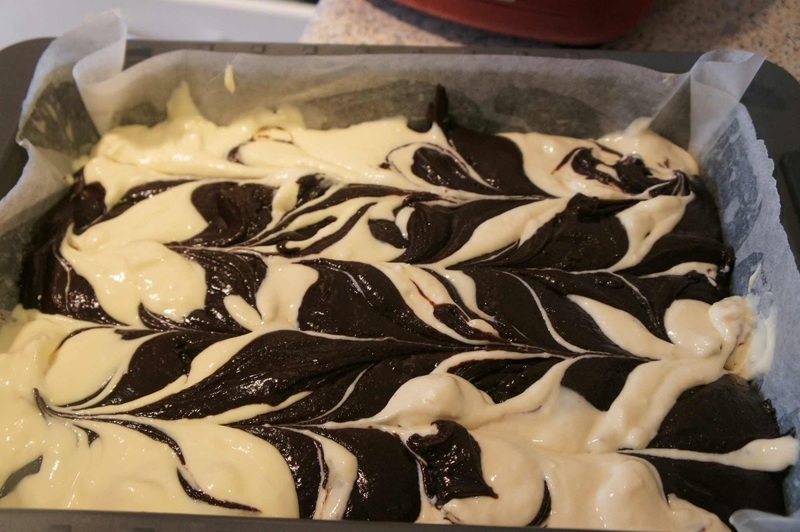 Sydney Shop Girl: Baking and Batch Cooking. I reckon you just need a day every once in a while that completely revolves around food. To just potter around for day at home baking and batch cooking. When I'm not under pressure to get something on the table in half an hour, cooking is a creative outlet with the pleasant secondary benefit of a tangible result. And today was the perfect day for it. Nothing but rain and grey skies outside, I really had no choice but to spend the day in the kitchen, suitable attired in trackies and ugg boots. I started the day by being completely honest with myself as I completed the Good Food Karma Index. It's a quick, fun and interesting survey about what you eat and your attitude to food. Your final score compares you to the rest of Australia and then there is the option of getting some more detailed feedback on your responses from the perspectives of a dietician and a social researcher. For the day's baking projects, I set myself the challenge of using a recipes from any one of my numerous cook books. I'm one of those cook books as art kind of people. I have a book case full of the latest must have cook books but they're all still pristine because none of them have made it to the kitchen yet. 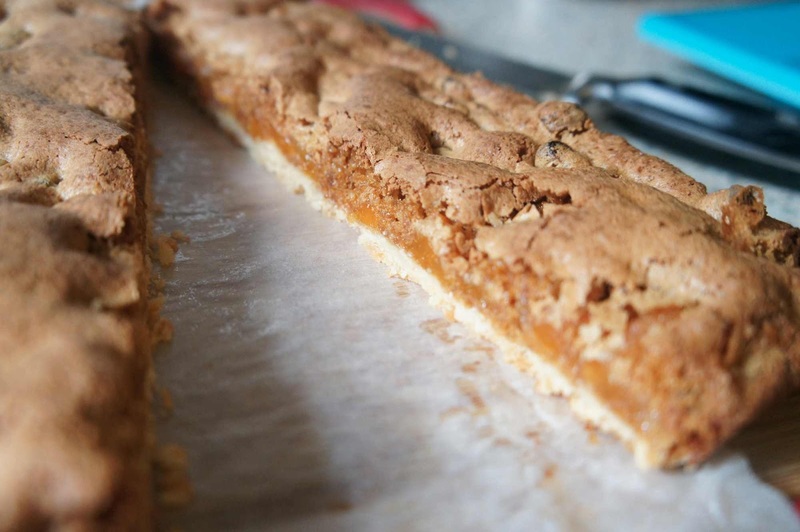 The first thing I made was Donna Hay's Apricot Oat Slice from Modern Classics Book 2. I know, such a departure from my usual form. Where's the chocolate? The recipe isn't on Donna's website so here it is. 1. 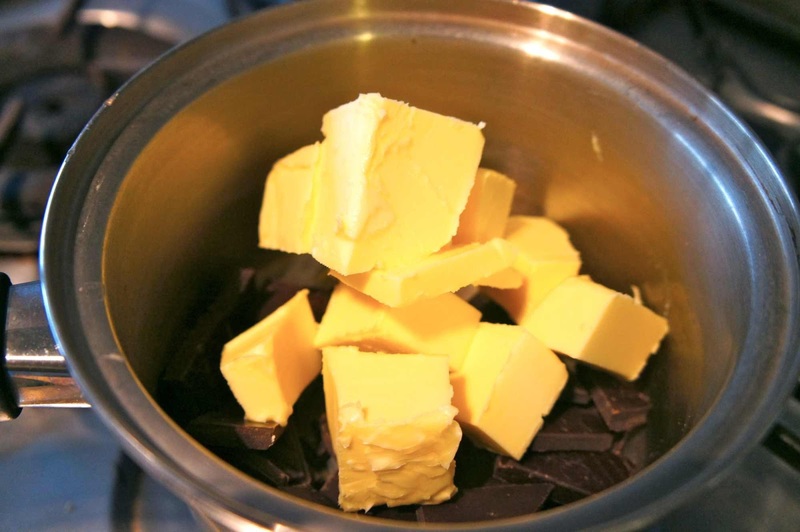 Place butter, sugar, plain flour and rolled oats in a bowl and mix to combine. 2. 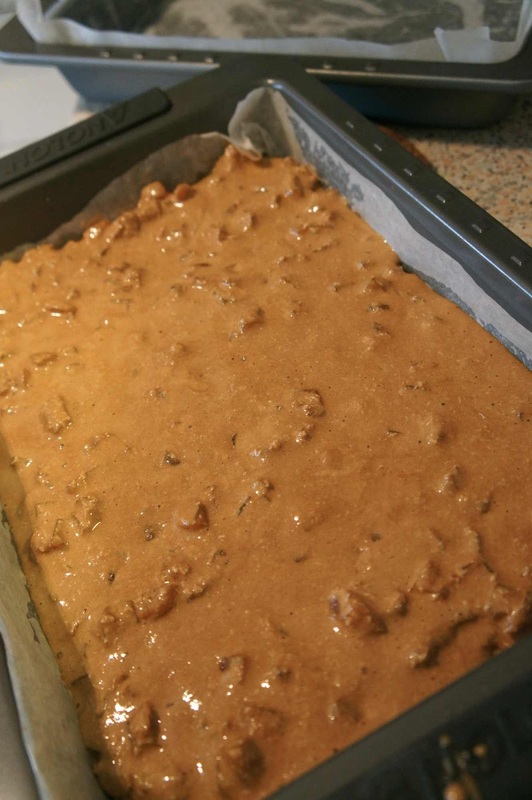 Press mixture into a lined 20x30cm slice tin. 3. Bake for 15mins or until golden. 4. 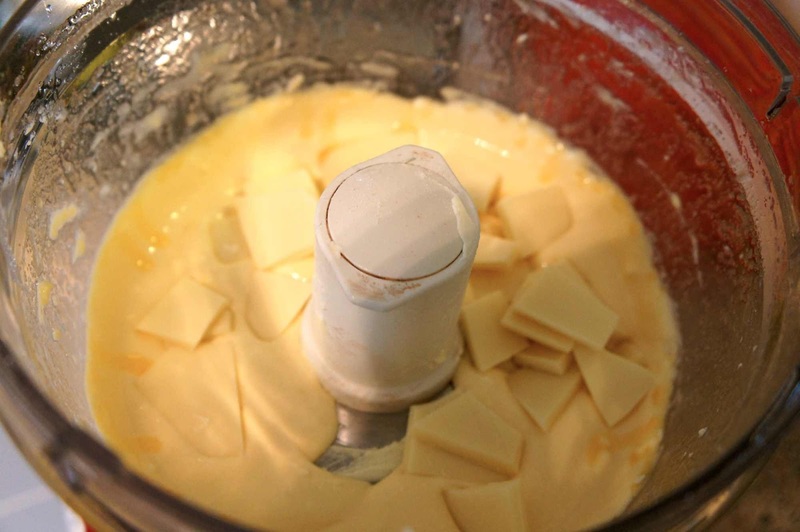 To make topping, beat eggs and brown sugar until light and fluffy. 5. 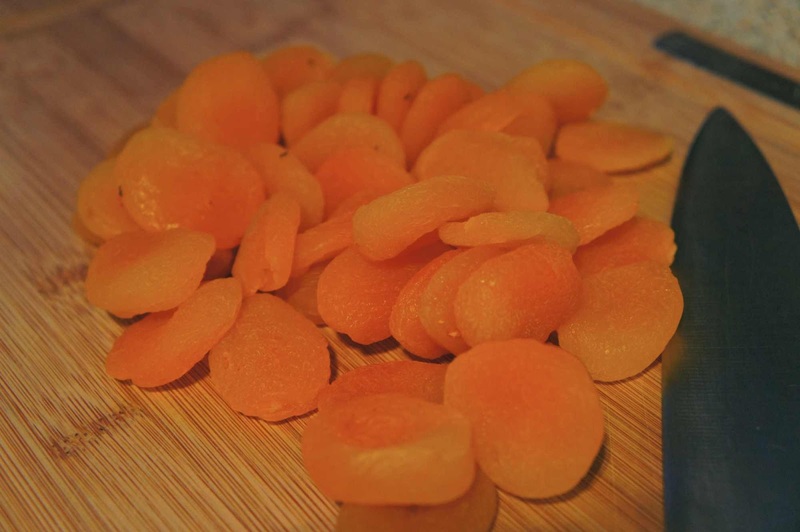 Fold in flour, baking powder, apricots and coconut. 6. Spread the topping over the base and bake for 20-25mins or until golden. 7. Cool in tin. Cut into slices. I had my usual 'will there be enough base for my slice tin' moment but I really should learn to trust in the Donna. There was just enough to fill the base of my tin. I found it easiest to press the base by hand rather than using the base of a drinking glass technique. Okay, the topping isn't exactly pretty going into the oven but let's not be too quick to judge. Here is how my slice looked out of the oven. The brown sugar in the topping gives the apricot and coconut an almost caramel taste. No doilies? No worries. I improvised with a few squares of baking paper. It also slices beautifully, even with my knife skills. The crisp biscuit base is a perfect foil for the apricot layer. 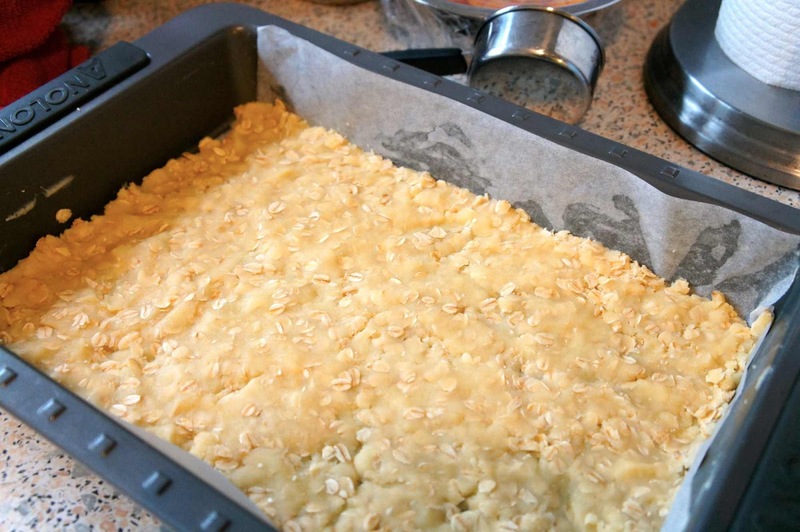 It's not like your usual buttery rich, crumbly fruit slice. I hope it's a hit at morning tea tomorrow. It didn't take long for the chocolate to turn up in this post, did it? Morning tea on a Friday can't all be dried fruit and oat based. Especially when it's the Friday before the long weekend. 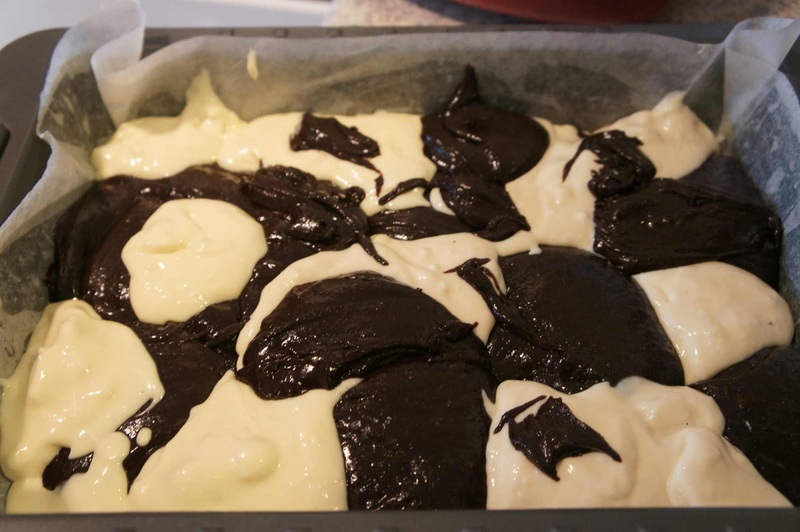 For my obligatory bit of chocolate baking I found yet another brownie recipe. Though I found it online, it's technically still from a cook book I own. 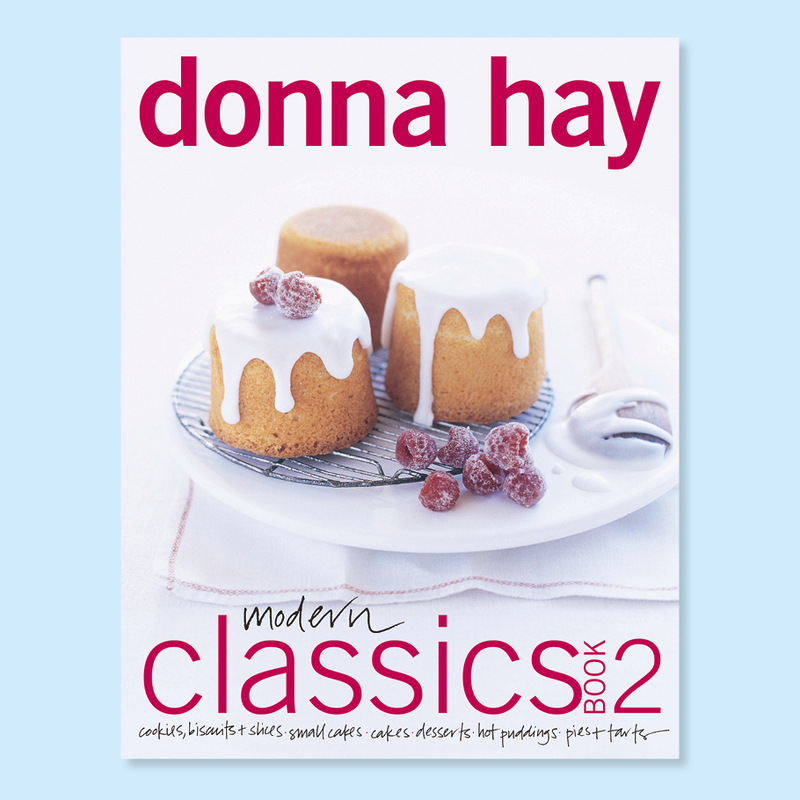 Donna Hay's Modern Classics Book 2 again. 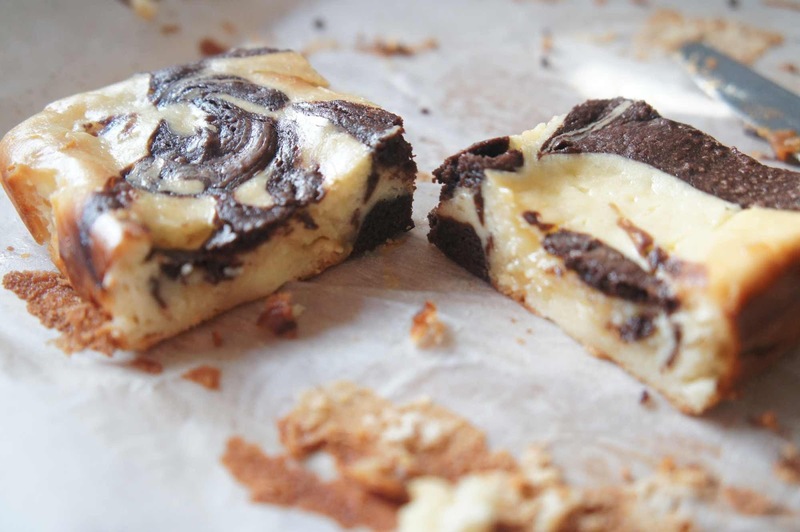 Over on page 24 is Donna's recipe for Chocolate Cheesecake Brownies. However I found this version on the Best Recipes website which featured the genius addition of white chocolate to the cheesecake mixture. I'm a big fan of chopped chocolate over choc chips which is why I blitzed a block of Lindt's Extra Silky into the cheesecake base. 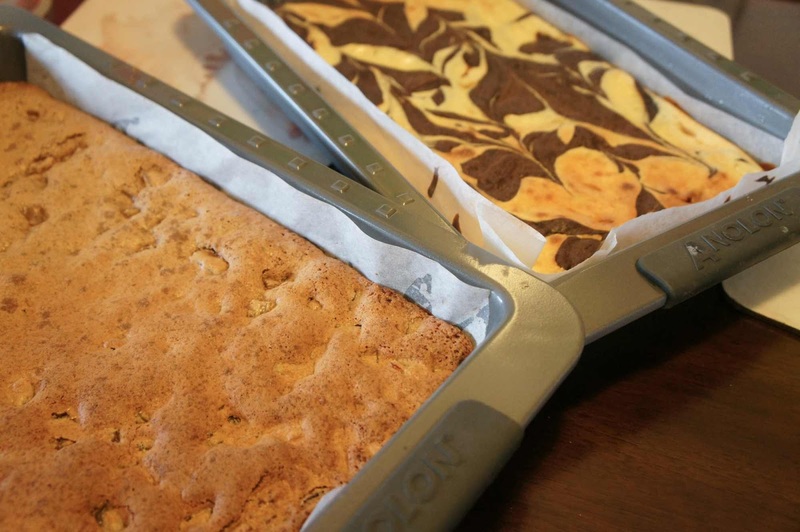 Here's my brownie batters co-mingling rather ungracefully in my slice tin. Here they are looking a little more glamorous after I dragged a metal skewer this way and that through the tin. I might have had a healthy lunch whilst everything was baking but don't feel sorry for me because afternoon tea featured a few off cuts from my baking as I got everything ready for tomorrow. They're a very dense and moist brownie. Much more difficult to resist than those ill fated AWW Tim Tam brownie from the May 2014 issue. 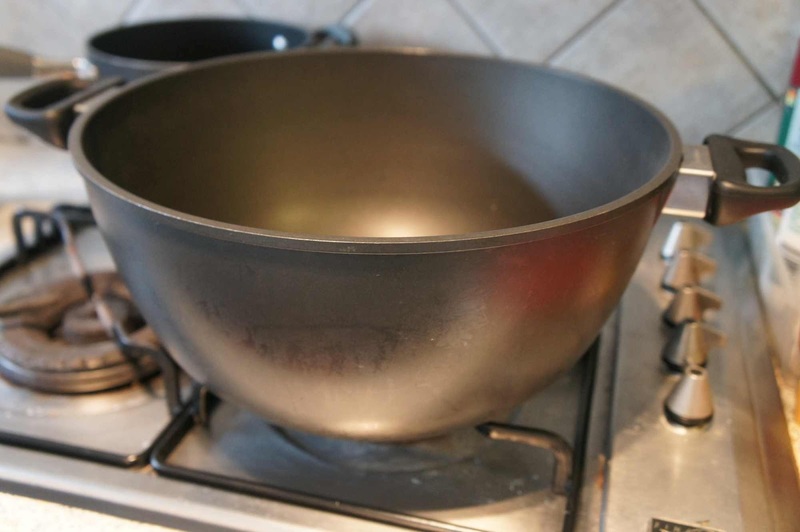 The ceremonial heaving of the soup pot onto the stove from it's summer palace in the spare room. 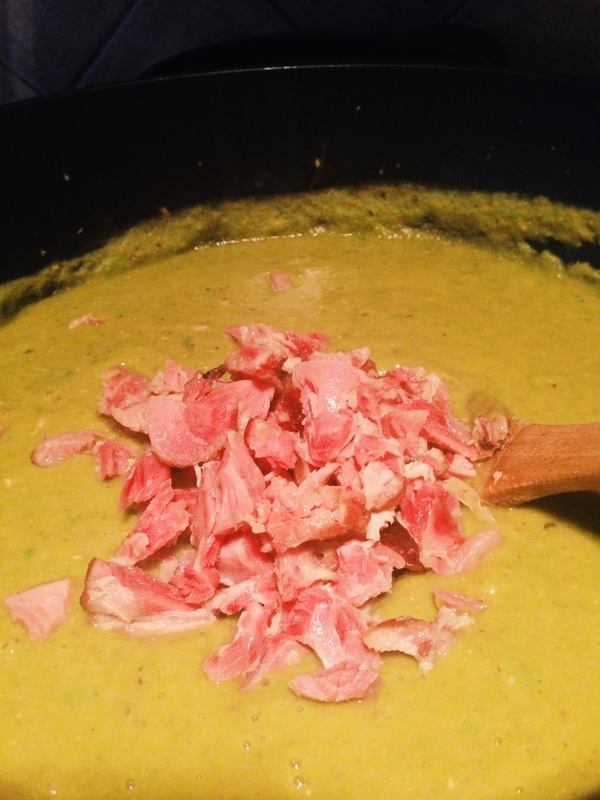 My final project for today was Julie Goodwin's super easy Pea and Ham Soup. 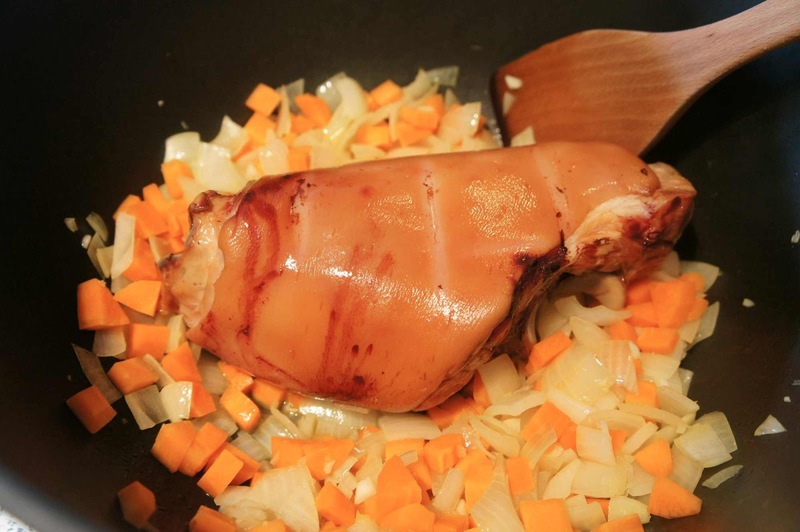 I didn't use the full weight of ham hocks in the recipe. Instead, I went for a 50/50 split of hock and a packet of pre shredded ham hock meat. Saved a bit of time and mess. The 500g pack of hock meat retails for $8.99 from memory. These are my dried peas that were soaked overnight in a teaspoon of bicarb. The bicarb really did make the peas look that much greener today. The packet of peas I bought was only 375g and Julie's recipe called for 500g. I made up the difference with some pre soaked dry bean mix. I like how easy this recipe was. Sauteeing the carrot, onion and garlic, popping the hock on top then adding 2 litres of water with the pre soaked peas. Because there's so much flavour from the hock, you really don't need stock or added herbs. 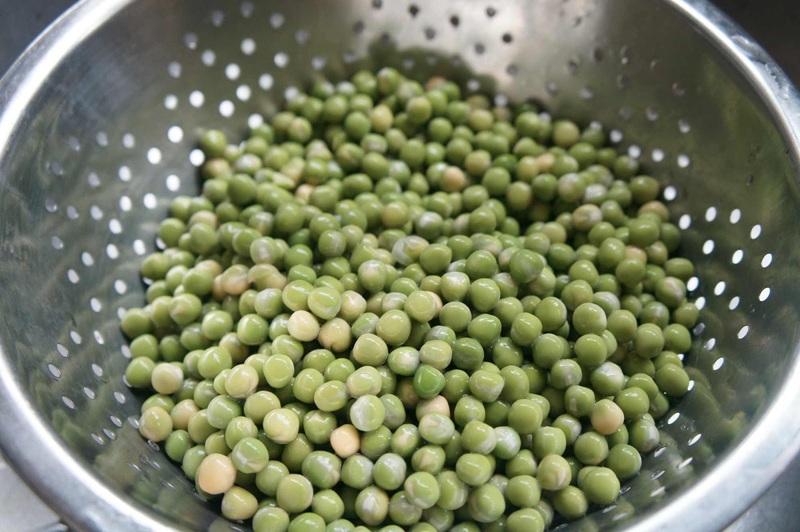 The addition of frozen peas in the final minute of cooking gives the soup a fresher taste and lighter texture. Making pea and ham soup look glam in a photo isn't a skill I have but here's what my soup looked like this evening at that stage between pureeing the soup and returning the ham hock meat to the pot. All you need to add when serving is a good sprinkling of cracked pepper and some bread. Have you started making your soups for this winter yet? What's your favourite? That is an impressive list of home baking and cooking! Glad the apricot slice was so well received! 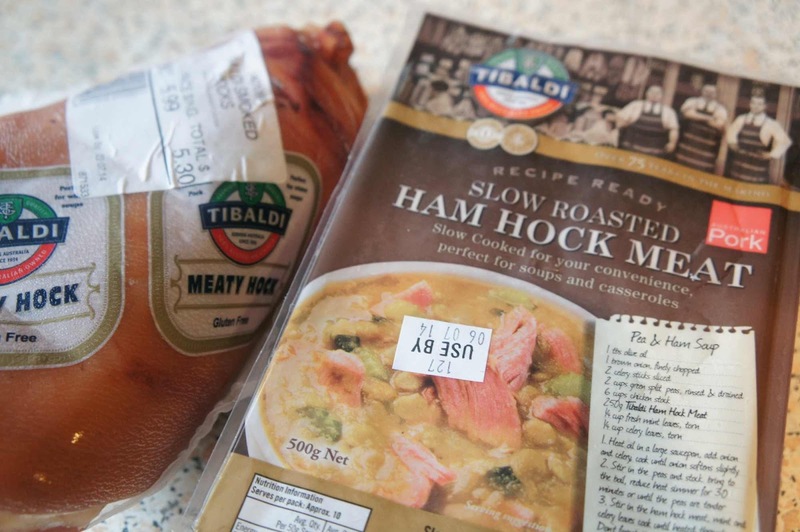 My husband and I were just talking today about pea soup, and ham hocks. How coincidental that I found your post tonight.